So, we're down/over/across in Devon, and now it's light I can see outside... This is the view from James and Kats window. And it carries on like that! 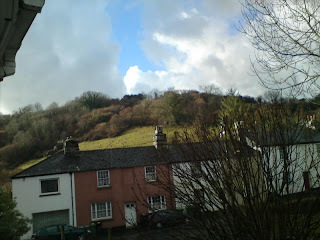 And no, it's NOT a wonky photo, those houses are on a fairly steep hill! See how nice it is, living in the country! As much as I miss Basildonia, it's scenery like that which makes me glad to live in the sticks!